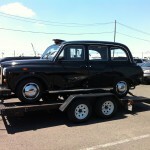 For sale: a London Taxis International Fairway – aka a London Black Cab, here in the USA. The owner is in Syracuse, New York, and he has decided to part with his X Reg cab that was rebuilt, lovingly restored and imported by LTE. 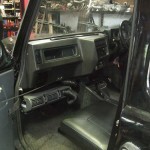 Joe had no plans to sell his car, and thus no expense was spared in the restoration – it really looks like it has a great body and interior as you can see from the photos below. In addition, Joe reports it has new major mechanical systems to compliment the unstoppable Nissan TD27 – a 2.7l diesel engine that will run for half a million miles or more in strenuous stop and go traffic. I must say that since this is the first cab I’ve seen in a long while in the USA with working AC, I was tempted to buy it myself. Then I could use it as a daily driver to promote my business, titillate the kids and possibly set it up as a wedding limo too. Although I could just as easily rent it out by the hour in a peer-to-peer car sharing network with GetAround.com and not have to deal with any more wedding planners than absolutely necessary. But alas, we already have one more car than drivers in our house, and two more cars than available parking spaces, so I’m going to have to pass. 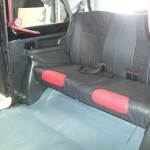 The bottoms of all black cab doors need strong care – this is not at all unusual. If you’re interested, give Joe a call at 315-307-1494. 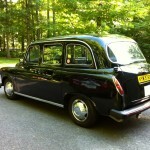 If you want to sell your London Taxi in the USA, get in touch. I’m happy to oblige. Fairway old enough to import to the U.S. that’s still in good shape or been restored. Would you tell me what you’re asking for this car? I may be very interested. There are a few tricks around the import / exemption laws I’m led to believe. Call the number in the post to find out an asking price, and I’ll send your email address to the seller! Good question – let me check! The phone number doesn’t work. 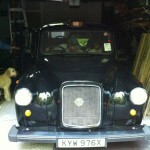 Please let me know if this cab is still available for purchase! Let me put you in touch with the owner Allie. Ian again from Western Australia. 4 regd cabs ar e 1973, 1978, 1981, 1984. “Franky” is 1978 and nearly ready for reg. 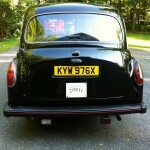 3 spare parts cabs are 1964, 1982, 1987. “Ghost” has Nissan TD27 diesel, “Winston” has mid 1990s Mazda R2 diesel, “Rat” (blakmajic) has mid 1980s Mazda R2 diesel, “Vampire” ( black ext, red int ) has Landrover 4 cyl diesel. Rat due for rebuild but still runs well and has noisy reverse gear. 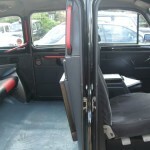 None of the cabs are immaculate but are in very good condition for age. Just watch the heads turn! Selling due to illness in family. Open to offers!! 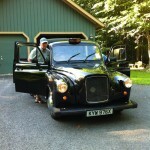 I am actually an ex London cabbie, 1988 – 2001, now in Nova Scotia, still have my badge 48882, I’m interested in buying a cab for vineyard tours here, is it for sale?